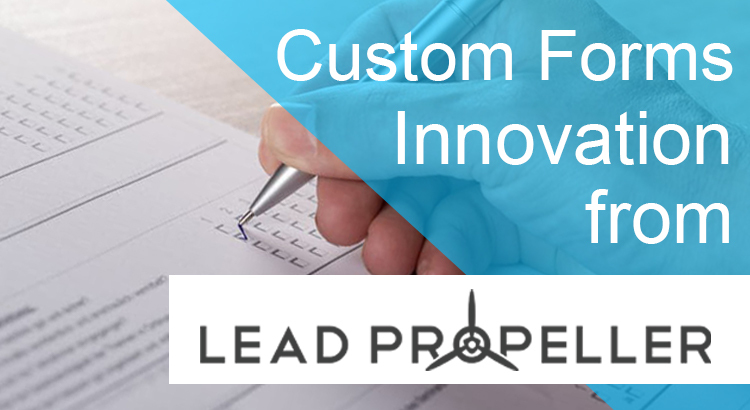 Custom Forms Another LeadPropeller Innovation! Everyone knows what a form looks like. In fact, you have them on your website already. But why is having custom forms such a big deal for real estate investors? That’s what we’ll be talking about today! We’ll go over what makes custom forms so high converting, how you can customize your own, and the other awesome features involved like text and email auto responses. That way you won’t lose another lead because of slow follow up time. Let’s go! What is a Custom Form? You know the short form on your LeadPropeller home page? That’s an example of a form. On that form there are 4 fields the motivated seller can submit their information to you through. And, once that form is complete, you get an email and a text to let you know a motivated seller just visited your website and is interested in selling. Awesome, right?! You already knew that, though. Custom forms work the same way. Except you’re the one in control of what’s on the form, how you receive the notice that it’s been filled out, and what kind of auto response gets sent and what it says. But we’ll talk about all of that a little further down. There are other custom form builders out there, and they work fine. But here are the problems with using them for your real estate investing business. Getting the form on your website now requires coding and back end knowledge. Gross. You don’t have time for that. You will now have to open up the third party custom form builder any time you want to edit it, then re-copy the embedded code, re-save and re-publish your LeadPropeller site. That’s way too much work, and leaves too much room for error along the way. Which will cost you leads. Your data is saved on their site, not your site. The conversion and customer tracking that the custom forms will bring aren’t on your LeadPropeller dashboard, so you’ll have to cross reference when you’re analyzing marketing data. The templates that those sites have are full of generic questions. You can’t make questions specific to real estate investing questions as you need them to be. Now, we’re not saying that these are bad sites to use – just that they’re not the right fit for a serious real estate investors. Plus, you don’t really have a website through LeadPropeller, you have a high converting online lead generator. It just makes sense to use custom forms here because that’s what these are built for! For you to get as many leads as possible without making things complicated. First and foremost, custom forms are here for you to get information from motivated sellers. Both information about the property they want to sell, and their contact information so you can follow up with them before your competition does. Which, as we’ve already been over when we talked about high converting websites, is huge when it comes to landing the deal. When a visitor to your website fills out a form you’ve made, that information is logged in your LeadPropeller dashboard for customer tracking. Which, if you don’t use this feature you should. The information there will help you hone in on your target area, and where your most responsive motivated sellers are coming from. That way you won’t have to guess with future marketing strategies like PPC and Adwords. After a custom form is completed, the motivated seller will get an automated text or email from your website that you customize (so it doesn’t seem automated). This lets your customer know that their information was received by a real person, and that whoever got it is quick with communication. Two things that are necessary when it comes to lead to deal conversion. The way the auto response system works with our custom forms is simple. When you’re creating a form, there will be two sections beneath the name and description where all you have to do is type in what you want your automated response to be. Boom. Super easy. And the best part? The texts and emails will come from the business number and business email that you put on the business page of your LeadPropeller dashboard. That way, the communication between you and your customers stays consistent! And it’s all as simple and just typing a few words. The difference between just having a form, and having a custom form is how specific you can make it. Especially for real estate investors, there is certain information that you’re more interested in that other form builders don’t offer. Ok…cool? But that’s not really information that’s actionable for you as an investor. You can’t really buy or sell a house from someone leaving a vaguely worded reason for visiting your website. Why do you want to sell your house? Have you done any repairs to it? When was your last overdue payment made? By using a custom form on your website, you can accomplish a few very important things. Carefully wording your questions (like the ones above) will not only get you practical information about the property, but will also get your motivated seller back in the mindset of “I need to sell this house now“. And because your customer has gone back into that mindset, when it comes time to answer questions about how much they would accept for the house they are more inclined to take a lower price. Do you know what that mean?? That your form is already negotiating for you before you even contact your motivated seller! Whaaaaat? That’s amazing! Ok, ok, as exciting as that is, actually making custom forms through LeadPropeller is just pointing and clicking. We try to make everything as simple to make and use as possible. But this isn’t a tutorial – you can find that by going to the LeadPropeller YouTube Channel. One form can be used on as many sites as you want, and as many pages as you want. That’s…that’s it. Super easy huh? Plus, having your custom forms on more than one page and website is just allowing more access points for visitors to your page to leave their information with you. The more custom forms, the more likely you are to get leads! You’ll notice that when you go to edit your custom forms in your LeadPropeller account that there’s only the form and not what website it appears on. There’s a reason for that. When you edit your custom forms, let’s say you want to reword a question, you only have to change it one time. No matter how many of your sites the form is on. That’s right. Just edit in the custom forms editor, and hit save. All of your sites that that form appears on will be changed. It’s as simple as that! We would talk more about this, but really there’s nothing else. Easy peasy. Are You Using LeadPropeller Custom Forms? I mean, why wouldn’t you be using them? It’s amazing how high converting they are. The reason is because it’s an interactive element to your website and pages. When motivated sellers go through these custom forms, they feel like their information is being submitted to a credible business. That credibility continues to build when they get an auto response within 5 – 7 minutes of completing the form. Because LeadPropeller has programed auto responses to send with a few minutes lag, it feels more authentic to your customer. And, because you’re the one who wrote that auto response, it really is your genuine words that they’re reading. All of that works together to make them more inclined to continue communication with you. So only one questions remains: what will your custom forms look like? How Should You Market Your Real Estate Investing Business?